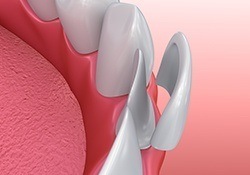 Veneers are extremely thin layers of high-quality restorative material. 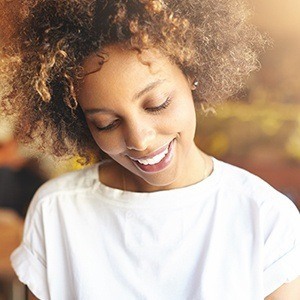 Unlike traditional crowns, they’re designed to be placed over just the front surfaces of teeth instead of the entire shape, hiding years of cosmetic flaws and imperfections from view behind a new, stunning appearance. At Atrium Family Dental, we offer two types of veneers: resin composite and porcelain. In most cases, resin composite veneers can be completed in just one appointment. While the procedure is less expensive than its porcelain counterpart, the improvements will not be as durable and long-lasting. Alternatively, porcelain veneers will require at least two appointments. They are painstakingly fabricated in a trusted dental laboratory setting, using detailed impressions that our dentists will capture during your initial visit. Once completed, porcelain veneers are highly lifelike, beautifully customized, and meant to last for a decade or longer. Patients can even alter the sizes and shapes of certain teeth if they choose to do so! To learn more about this transformative procedure or schedule a first appointment here in New Lenox, please contact us today. The average cost of a custom-made veneer will vary greatly from patient to patient. The basic average for a single composite resin veneer is around $600, while a single porcelain veneer may range from $900 to $1400. The best way to discover your personal estimate is to schedule a one-on-one cosmetic consultation with our dentists here in New Lenox. Before investing in a smile transformation with veneers, we can provide patients with a sneak peek of their new and improved appearance. Our trusted dental laboratory will fabricate detailed models of your mouth (using an impression captured by our dentists of the pre-treated teeth) and then add wax to accurately depict the veneer. This will help our team make any important adjustments to the design and move forward confidently with your treatment plan. Veneers can improve smiles quickly and leave patients feeling satisfied at last about the image they’re projecting to the world around them. Please don’t hesitate to contact Atrium Family Dental Care today if you’d like to learn more about whether or not you’re a good candidate for this cosmetic service.